That’s no moon! Death Star is a new popular all-in-one Kodi addon combining multiple other add-ons into a single, easy-to-use interface. Brought to the Kodi community by an extraordinary group of development teams, Death Star makes its home in the UKodi1 Repo. This is a truly monstrous, smart, and stealthy collaboration manifesting in a super-build including over 30 of the most popular Kodi plug-ins. An empire of addons awaits you in the Death Star mega-addon. This collaborative Team UKodi1, DNA, ONENATION, EzZeRmAn, EXPOSE, and NOLENATION venture culminating in the Death Star addon combines some of the most popular and best working Kodi addons in one place. These include WOW, M.E.T.V, DNA, House Of Blue, Leviticus, One Click, Expose, Wumpa Fruits, Cer3erus, Discovery, and many more. Below we will supply you with both quick steps along with a more detailed illustrated MTM installation guide for Death Star Kodi addon. Pick what serves your personal needs best and gain free access to one single Kodi addon with exceptional star quality for an all-in-one streaming experience. Say yes to Death Star today! If you’re experienced and at ease with installing Kodi third-party add-ons follow the quick install steps below. Look farther down the page if you’re needing a bit more instruction, there you’ll find an instructional guide with screenshots on how to install Death Star Kodi Addon. Experienced Kodi users have probably already enabled unknown sources in Kodi 17 or later. If not, make sure to do so before proceeding. 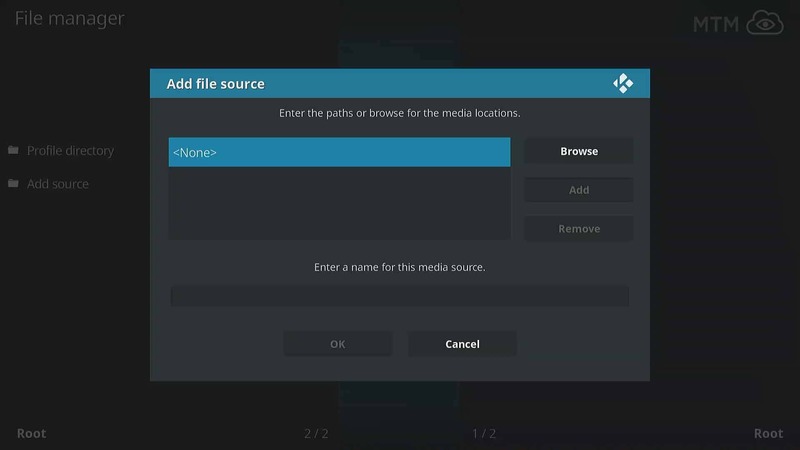 Launch Kodi, click System >> click File Manager >> click Add Source >> click <None>. Type http://ukodi1.com/_repo exactly >> click OK >> name media source ukodi1 >> OK.
Kodi menu >> click Addons >> Add-ons browser >> click Install from Zip File. Click Install from Repository >> click ukodi1 >> Video Add-ons >> click Death Star >> click Install. As previously mentioned, you need to enable unknown sources before moving forward, or you’ll not be allowed to install Death Star third-party Kodi addon. The XBMC Foundation security warning is intended to bring awareness of the risks of streaming and is required if you’re using Kodi v17 Krypton or newer. No matter what you’re online activities consist of it’s always a good idea to have your VPN on to secure your privacy and personal data. Launch Kodi, go to the System page by clicking cog icon on top. Once in System menu, click on File Manager at the bottom right of the screen. Select Add Source from the left tab of File Manager. Then, click <None> for file source. Type the following URL with care: http://ukodi1.com/_repo. In the next box name source ukodi1 and then double check for errors and click OK. Installing the Death Star Kodi Addon will be easy once Kodi has the repo source. Circle back to the Kodi home screen and choose Add-ons. Click on the Add-ons browser represented by an icon located in the top menu. Then, choose ukodi1 repo source and press OK. Select the latest available repository.ukodi1.X.X.X.zip and click OK again. As soon as you see the popup informing that UKodi1 Repository installed, you’re ready to download Death Star Kodi Addon. Feel free to explore all that the UKodi1 Repository has to offer from numerous Kodi Developers. Head into the Add-ons browser, and choose Install from Repository. Then, click Ukodi1 Repo to open it. Enter into the Video Add-ons directory of the repo. Lastly, click the Install button. You’ll know that Death Star is ready to become your superweapon of streaming once you see the Death Star Kodi Addon enabled notification to appear from space. Fire up your IPVanish VPN app to anonymously enjoy all the great content streams from the Death star team, this all-in-one Kodi addon has you covered! Note that all the Kodi video add-ons you download will be located on Kodi’s home screen in the Addons tab. Deathstar V2.8. being the latest version of this combination Kodi addon as of the time of writing. It contains a new section named Devastation with movies, TV, 24/7, live TV, sports, and more it is worth checking out as are all the other channels included within Death Star Kodi addon. Discovery has both live IPTV and catch up TV shows and Leviticus appears to be a multi-source addon fork (like Exodus or Covenant). Found in the UKodi1 Repository and others, the Death Star Kodi Addon features a Huge, moon-sized collection of awesome free streaming content such as TV shows, movies, live sports, animation, documentaries, and great classic and modern music. Speaking of music, Death Star keeps you updated with sections within different channels. Notably, WOW has the weekly top 40 songs in both the US and UK. Get the party started with a ton of 4K music videos, too! Deat Star, look no further if you want an awesome HUGE all-in-one addon that functions like a build allowing you to watch free movies and TV shows online. WOW SlaughterHouse aims to scare! If you love a good scare, check out the slasher films and great horror movies in the SlaughterHouse subcategory located in WOW. You’re gonna fall in love with the WOW SlaughterHouse channel within Death Star. It has a huge offering of horror movies. Enjoy an extensive selection of horror TV shows within this category, notably Z Nation to American Horror Story and everything in between. The Death Star addon functions as a mega build with its conglomeration of other awesome add-ons available under one great moon-sized interface. You may need to free up some space on your device to make room for this machine of sorts. Give Death Star Kodi addon a try if you’re looking to cut the cord and seeking good freely available alternatives. Make sure to check the laws in your area and be aware that some of the content found by the Death Star Kodi addon appears not to have been properly licensed for distribution.